As leaders of Oregon’s consumer-owned utilities, we are writing in the spirit of collaboration to urge the state of Oregon to constructively participate with the rest of the region on the operation of the Federal Columbia River Power System. Unfortunately, this collaboration has been sorely lacking even though we share a common interest in advancing salmon restoration in our great state. Meeting endangered species responsibilities to protect salmon is an important part of being good stewards of the Columbia River System. Moreover, we believe partnerships that shift relationships from adversarial to collaborative are the best way to identify opportunities to improve salmon survival. By any measure, we have made enormous progress. Salmon and steelhead species in the Columbia and Snake rivers have increased significantly since the first Endangered Species Act (ESA) listings in the 1990s. Based on National Oceanic and Atmospheric Administration (NOAA) data, chinook numbers have more than tripled, and wild steelhead numbers have doubled in that time. Hatchery fish display similar trends and help conserve the genetic resources of the species by providing a safety net in times of poor climate and ocean conditions. Our utility customers cover most of the costs of the programs that produce these results. We are proud of these achievements, but it is important to note they come at a significant cost to our consumers. Providing safe fish passage through the eight federal dams on the lower Columbia and Snake rivers is the centerpiece of regional efforts to mitigate the impacts of dams on juvenile salmon and steelhead. 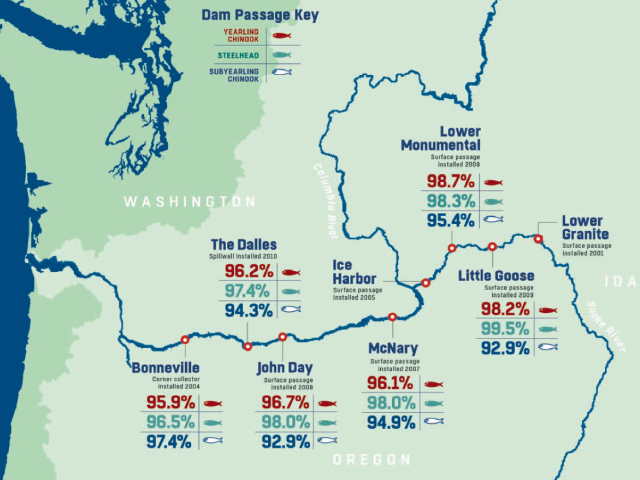 Surface passage systems are now operating at all federal dams on the lower Columbia and Snake rivers. Surface passage has reduced the percentage of fish that go through powerhouses (i.e., turbines), decreased fish travel time through the system, and increased overall fish survival. The juvenile survival performance standard target is 96 percent for yearling chinook and steelhead. This standard metric was developed through sovereign collaboration. The rigorous method for testing and satisfying the standard is reviewed by independent scientists and demonstrates that all eight federal dams are on track to meet performance standards. Nevertheless, the state of Oregon filed a request for injunctive relief with the U.S. District Court seeking even more spring spill at the dams, which can have negative consequences for fish and increases electricity costs for Northwest ratepayers. Oregon’s request is estimated to reduce hydropower generation by about 815 average megawatts over the April to June period. This approach could cost about $40 million a year on average in reduced revenues and/or increased power acquisition costs. It is undeniable the impact of additional spill will fall disproportionately on consumers in areas of the state with lower household incomes, particularly rural areas. Moreover, this loss of hydroelectric generation is also contrary to the state’s carbon reduction goals, as it will increase purchases of power on the wholesale market of fossil-fueled generation—potentially adding carbon equivalent to a 1.7 percent increase annually above current Pacific Northwest electricity sector carbon emissions. Your personal leadership is required to bring the state of Oregon to the table with other Northwest states, federal agencies and tribes to construct a plan for additional spill for 2018 to comply with the district court’s order. As this process unfolds, we urge you to consider economic and societal impacts on lower-income communities and the impacts on meeting our state’s carbon goals— both issues for which you have been outspoken. We are interested to hear your vision for salmon restoration and affordable electric rates and stand ready to meet with you to formulate a plan that strikes an appropriate balance between energy production, the economy and our state’s environment.